A particularly difficult pub to find, but you will be rewarded well when you find it on the northern side of Silverdale village. The building itself is a former country house and dates back to the mid-19th century and it backs onto Eaves Wood (now owned by the National Trust). 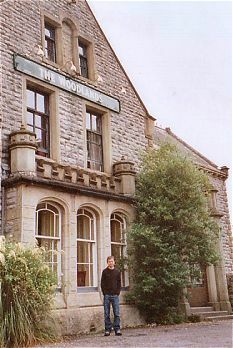 The pub can be accessed either from the west up the steep Woodlands Drive, or from the southeast by turning up Cleveland Avenue (opposite the cemetery) which rises above the east-west lane Park Road. It did strike me as a very unlikely building in which to place a pub but I think that it works quite well. Large country house, circa 1878, on the edge of the village with its back to Eaves Wood, hence the name. The current owner is restoring it to former glory. Much of it is somewhat tatty, but it’s the sort of place you can return to in subsequent years to admire the restoration work carried out. Easily overlooked by the casual visitor to Silverdale, so most of the trade is provided by locals. 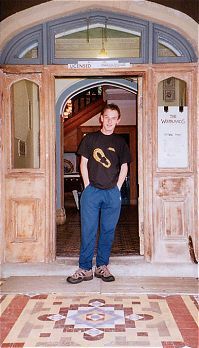 Even when you find it, it doesn't look much like a pub - open the big front door and you find yourself in an impressive entrance-hall with no sign of a bar, but go through the first door on the left, pass through a lounge and there it is. Look to your left for a list of the available ales. The bar has a large fireplace (as big as the counter), little plastic suits of armour, a big painting of the Johnnie Walker man and great views across the Bay. The other door on the left leads to a pool room, where the beer-pumps are. The beer range varies, but there's always a good variety of brews from independent breweries and the brews that we tried were all in excellent condition. No food, but who needs food when you've such fine beer available. An unusual pub well worth seeking out if you are in that part of the country.